Right from the beginning, he has played in a league of his. Sandro Hit defined the type of ultramodern dressage horse with his incredibly elegant, expressive and exceptionally moving offspring. Every rider would like to have such dancers under their saddle! Accordingly, his descendants were and are sold for high prices at auctions. Since 2012, Sandro Hit has been ranked amongst the top ten best dressage sires in the world. Since 2017, he is in second place of the WBFSH ranking of the most successful dressage stallions. 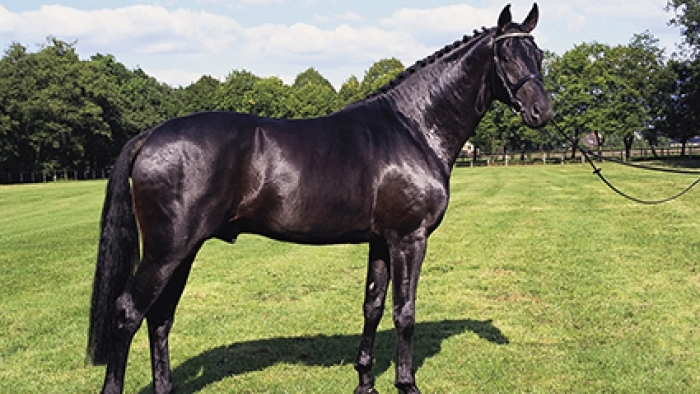 The hereditary performance of the jet-black stallion, who was World and German Champion, is absolutely unique. Believe it or not, he has produced 190 licensed stallions in Germany alone, which is far more than any other sire has ever been able to produce. The enumeration of his licensing winners, premium stallions and stallion market top prices would go beyond any scope. His daughters, 237 of whom were awarded the State Premium, are led by the dressage World Champion and double German Champion Poetin, who was auctioned for the record sum of 2.5 million euros at the P.S.I. Auction. The Oldenburg Champion Mare Silberaster OLD also won double gold at the German Championships and bronze at the World Championships for Young Horses. Furthermore, a daughter of Sandro Hit produced the Olympic Gold medallist, double World Cup winner and triple European Champion Weihegold OLD/Isabell Werth. The descendants of Sandro Hit have long since conquered the biggest championship stages around the globe. Five of them competed at the 2016 Olympic Games in Rio/BRA, including Showtime FRH/Dorothee Schneider, who became team gold medallist and came sixth in the freestyle, and Santano II/Christopher Burton/AUS, eventing team bronze medallist. In 2018, Salvino/Adrienne Lyle was part of the USA dressage silver team at the World Equestrian Games in Tryon/USA. Sir Donnerhall II OLD/Morgan Barbarcon/ESP were placed in the World Cup final in Paris/FRA. Sandro Hit is stationed at Deckstation Paul Schockemöhle in Mühlen.